I was lucky enough to get four tickets to the Wings vs Hawks game the other night from work. The seats were great, except for the VS camera guy obstructing our view the entire game. The game itself, wasn't so great, as the officiating was questionable at best and to top it off the Wings lost in overtime. Of course Hossa had to the the one to score the goal too. Enough of that, onto the reason for this post: free hockey cards. 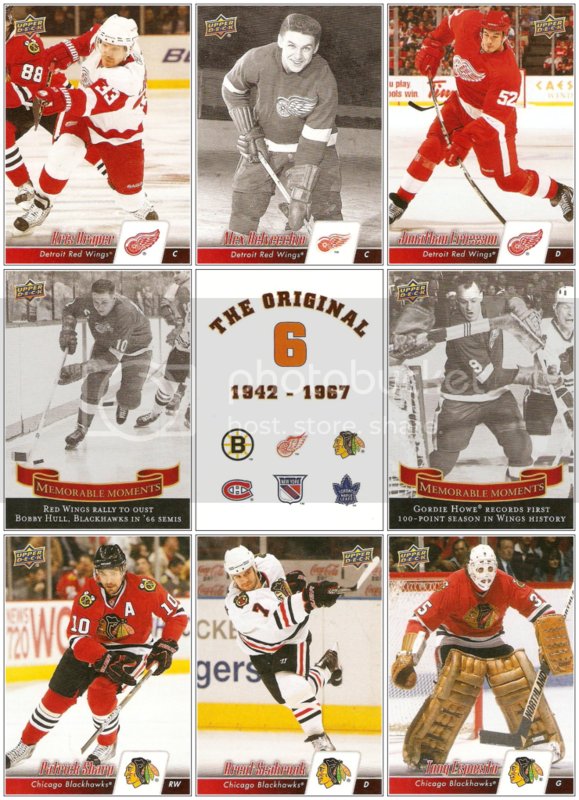 After passing through the metal detectors at the entrance, there were people handing out a special edition Original Six nine-card set. As you can see, most of the cards are based on the 2010-11 Upper Deck base set design. The Esposito is probably my favorite because of the old school goalie equipment. The cards were all printed on a single perforated sheet, so I had to tear them apart and stick them in my pocket during the game, but they made it through alright without much damage. Anyone else get any free cards from going to a game like this? This will be the first of my picks to not focus on a card of a single player, as it is also the first checklist to make the list. Checklists are rarely seen, but once I found this one I had to make it my latest pick. 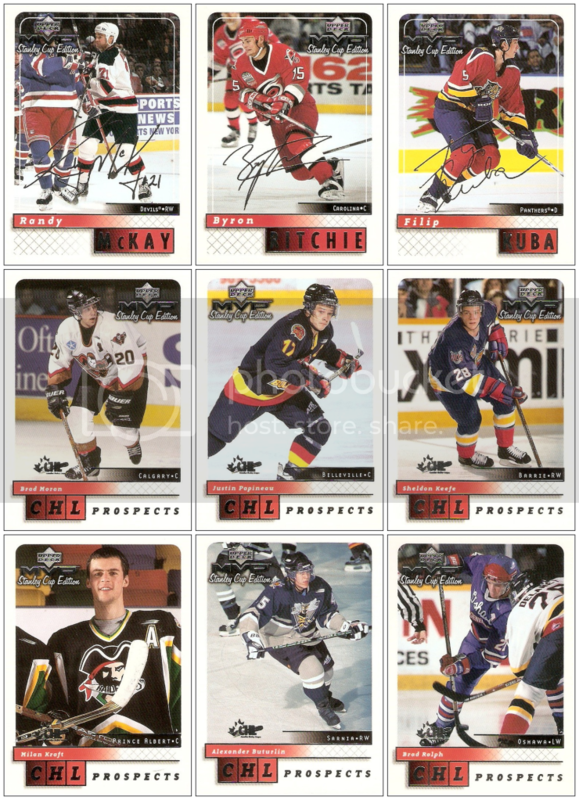 Specifically, this is a checklist for the insert sets that were part of the 1997-98 Donruss Canadian Ice set. Most checklists simply feature a single player or a generic action shot, but this one is different as it captures a great moment from Detroit's 1997 Cup run. It's kind of funny that a card that is supposed to be feature a Stanley Cup celebration picture nearly cuts out the Stanley Cup entirely. You can just barely see the top of the Cup on the lower left side. 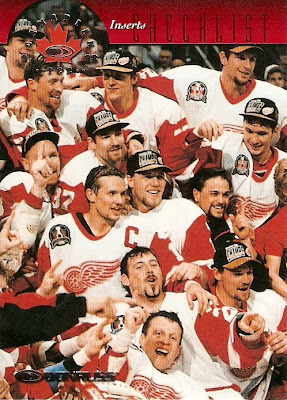 Some of the faces in the picture I recognize right away include Vernon, Lapointe, Yzerman, Kocur, Maltby, and Kozlov. Those names take me back a little bit, as I was a kid just getting into hockey when the Wings brought home the Cup that year. I wish more checklist cards would have pictures like this. It's something you don't usually get to see on cards unless there's a specific set dedicated to it. My latest ebay win just arrived and brought me another addition to my Super Script collection. This will be the fifth one so far in 2011, making for a pretty darn good start to the year for this set. Hopefully, I can keep up this pace throughout the year. The latest addition is this Petr Svoboda numbered 01/25. It's the first one I've gotten that is the first of it's print run. This one brings the set total to 19 and it brings another team to the collection in Tampa Bay. Svoboda is the greatest player in the world, but that doesn't really matter in set collecting, I'm just glad to cross his name off of my list. Luckily, I got this one for just $1.99, which kind of makes up for having to pay $26 for the Boucher. Split the difference and that's about $14 each, not far off from the average I've paid for one lately. I know I've done a few more "Thoughts" posts than usual lately, but I don't have much else to write about until a few more pickups arrive in the mail and this is something I just had to share. I was searching for some more SCE cards on ebay and came across this auction. I saved a screenshot of it in addition to linking to the auction page, which can be found here. I've never seen something like this before. I hope nobody believes they are actually guaranteed a jersey card like this, last time I checked there were these little things called decoy cards. How do I know this isn't a retail pack with one of those anti-theft decoy cards inside? 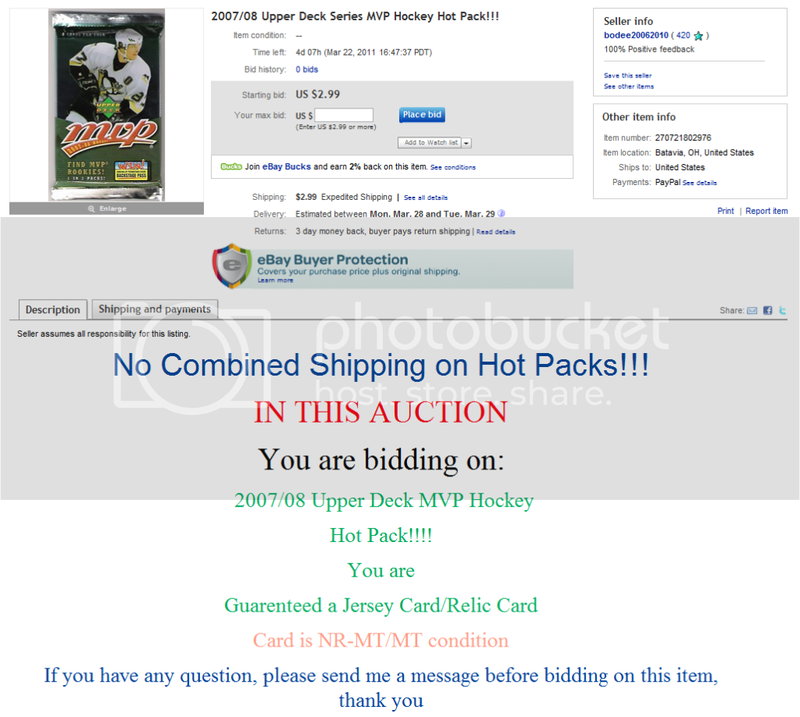 Has anyone else seen any kind of auction for a single so called "hot pack" guaranteeing a jersey card like this? Also, what are your thoughts on an auction posting like this? Personally, I don't like, but I also know better than to believe it. The other day, while searching for some Stanley Cup Edition singles on ebay, I came across two auctions for signed copies of two base cards: Mike Sillinger and Ray Sheppard. I don't know what to think. One the one hand, these would go perfectly with my Ink Script project, except for the fact that I wasn't the one who went about getting the signatures. On the other hand, most reasonable people, me included, would think selling TTM or IP auto's is wrong. I guess I just have one question. Is selling TTM or IP auto's right or wrong in your opinion? The last time I did an update on my Silver Script project was back in January when I picked up ten of them in a trade with Chris over at Confessions of a Hockey Card Addict. Since then, I haven't come across any more Silver Scripts until now. This particular Silver Script update is a bit different than the rest, as it only happened out of the generosity of another collector. A few days back I received an email from someone saying they had a bunch of Silver Scripts from my want list and I could have them for nothing more than the cost of postage. When the package arrived the other day, I pulled out two team bags filled with Silver Scripts, pretty much all of which I needed for my set. Here's a look at what I got. Of the 53 Silver Scripts in the package, I needed 45 of them for my set. I already had 56, so I pretty much doubled my Silver Script collection for just a few bucks. The total now stands at 101, which puts me at nearly 50% of the way there. A huge thanks again to the person who made this update possible. It's been a while since I've done one of these, but my latest Super Script pickup kind of forced my hand on this one. I say that because of the way the card arrived in the mail. It wasn't as bad as a PWE, and I've gotten a few of those before, but just something minor. That would be the way the seller put a piece of scotch tape across the top of the top loader. I tried to remove the tape, but failed and now the top loader is ruined in my mind because you can easily see the residue from the tape on both sides. Why is it so hard for people to use team bags when shipping things like this? In a perfect world, the basics should be: penny sleeve, top loader, team bag, and bubble mailer. If I'm paying more than $3 for shipping, I think that would be more than reasonable, don't you? Anyone else have any issues with seller's or trader's shipping practices lately? What's your idea of proper shipping practices? Wow, it's been a while since I've posted here. I've just been busy with work and other things lately, but I hope to get back to regular posts here soon. Anyway, onto the update. I came across this Super Script on ebay a few days back and knew I had to have it. I held the highest bid for most of the auction, until at the very end where the price jumped nearly $20 to a final winning bid of around $26, the most I've paid for a Super Script to date. The card I'm referring to is this Brian Boucher numbered 11/25. I told myself I would not let any more of these slip away, no matter the price tag. Well, I stuck to my word and I now have 18 Super Scripts to show for it, four of them just this year so far. As with the Hecht, the facsimile signature is kind of hard to see in the scan. These seem to be hit and miss with my scanner, some of them pick up more of the rainbow in the foil than others. This one brings me to 18/220, nearly 10% of the way there. Hopefully the next one that comes along doesn't come with this big of a price tag, especially given the fact that Boucher is nowhere near the biggest of stars from this set.